Oh he will! Now, this has been around for a while, but until recently I never had anyone to buy one for, which I needed as I don't personally have a willy of my own. Well, not one that is attached to me. This is exactly what to get a man who has everything. With this you can fluff (brush), style (shears), spruce (silverware mirror), dress up (chunky metal bracelet with mini medallion) and it all comes in a smart leatherette case. Admittedly, I thought this was more of a joke present, but I've been told it's very useful and although that was a bit of shock to me, I was secretly pleased this had more value than just entertainment. Another thing is that the styling "shears" as they are called, are not so frightening as they sound - they're really only small scissors...but shears sounds rather dangerous. 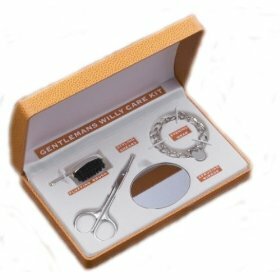 Finally, the Gentleman's Willy Care Kit will have your willy, or your man's, in good shape and groomed to perfection in no time at all, and we all know you can't keep down a well looked after willy. 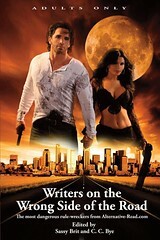 Now, that's got to be worth the money!